In the mood for some extremely clever songwriting coupled with brilliant musicianship? 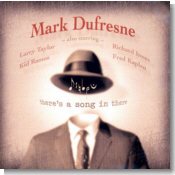 Then give Mark Dufresne's third release, There's A Song In There, a few thousand listens! I say a few thousand because after hearing this CD you'll more than likely play it at least that many times. DuFresne's poetic, down to earth lyrics are smart, original and full of both dry and wry wit, while his harmonica playing is as masterful as any of the top harp men in the business today. All 11 numbers are authored by Dufresne, who also handles all vocals with a commanding intensity similar to Kim Wilson's delivery. His voice is quite powerful and possesses a four octave range. Producer Lynwood Slim, a fabulously talented harp player and singer in his own right, has chosen the elite of west coast blues sessions for the supporting band on this very fine album. Fabulous Thunderbird guitarist Kid Ramos, the nimble fingered Fred Kaplan on piano, bassman extrodinaire Larry Taylor on upright/electric, and a veteran of countless recordings, Richard Innes, on drums. These four incredible players join forces once again to form one of the tightest units in the blues today. The opening piece, "Seasoned Veteran," is an anthem to those of us who have been around the block a few times and have the wisdom to prove it. "Born To Lose" is a humorous look at the great game of life, while "Take It All" is the story of a guy telling his cheating woman to hit the road once and for good. Both numbers feature stinging solos from Kid Ramos. With 2000 being a presidential election year, the politically themed "Squeaky Clean" might perhaps make the listener give a thought or two to the ballot they cast. The closer to this sensational CD, "Out The Door," is really two tunes in one, starting off as a slow mellow groove for the first half, then kicking into a boogying shuffle for the last half to end the album with a bang. The style throughout this album is definitely west coast jump blues with a slight flavoring of Memphis thrown in for a pleasing balance. To sum up this CD, I guess I would have to say that this is a completely "whole" album with superb writing, tight production, outstanding performances, and a tendency to make you smile a lot while listening. Pretty good for a pharmacist from Kansas City, Missouri now calling Seattle home, eh?